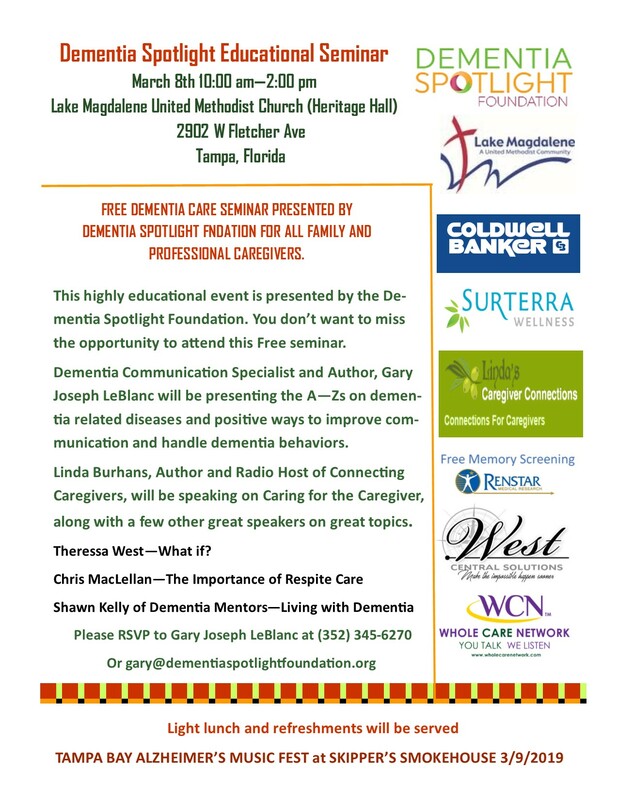 FREE DEMENTIA CARE SEMINAR PRESENTED BY DEMENTIA SPOTLIGHT FOUNDATION FOR ALL FAMILY AND PROFESSIONAL CAREGIVERS. This highly educational event is presented by the Dementia Spotlight Foundation. You don’t want to miss the opportunity to attend this Free seminar. Dementia Communication Specialist and Author, Gary Joseph LeBlanc will be presenting the A—Zs on dementia related diseases and positive ways to improve communication and handle dementia behaviors. Linda Burhans, Author and Radio Host of Connecting Caregivers, will be speaking on Caring for the Caregiver, along with a few other great speakers on great topics.